There are approximately 200 Filippini Sisters left in the U.S—a steep decline from fifty years ago. 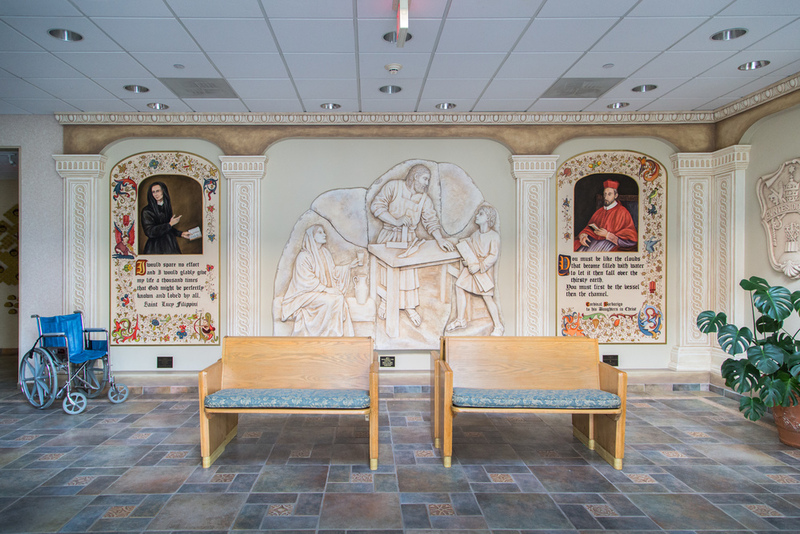 Villa Walsh, located in Morristown, NJ, serves as the “motherhouse” where many postulates begin their life in the Sisterhood. It also serves as a health care facility for those Sisters who are elderly, infirm, no longer able to teach, or at the end stage of their lives. Their age’s range from 69 to 103 years—many have celebrated over 75 years of dedicated service in the Order. At 100 years of age, Sr. Mary Testa enjoys playing Scrabble every day in the Infirmary’s Community Room. The scattered tiles spell words related to teaching such as: schools, teachers, pupils, books, girls, boys, and years. Sometimes when Sr. Mary and I would talk, she would stop and recite this cute little limerick. Alzheimer’s and Dementia are very common amongst the elderly Sisters. The Villa Walsh Infirmary is a home-care facility which houses approximately eighty aging Sisters that once—a long time ago— were welcomed as young aspirants to the Sisterhood. A Sister who works in the infirmary library, takes time out of her day to play an on-line game of Black Widow Solitaire. 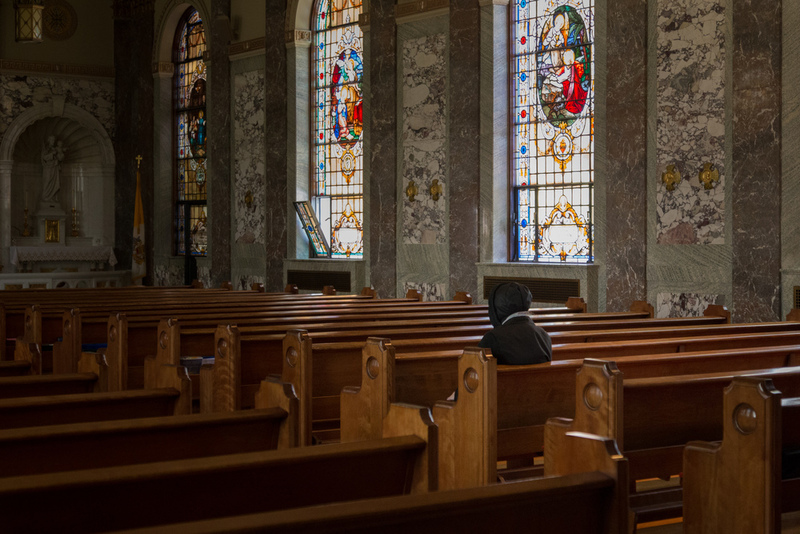 Inspired by her teacher, the news of Sr. Mary’s religious vocation hit her family like a bomb when she at thirteen said, “Today I want to leave and become a nun.” Her shocked mother replied, “You will never make it two weeks!” It’s been 78 years since that announcement. One day I asked, Sr. Mary, what do you think heaven is like? Was it hard to say good-bye to your parents at such a young age? How old were you when you decided to become a nun? Sr. Margherita known by many as the “The Fighting Nun” does not fit the secular stereotype of the traditional nun. She has dedicated herself in her later years to the fight to restore the truth and address the unjust attacks against the role of Pope Pius XII during World World II and the Holocaust—clearing his name and seeing him beatified. The Sisters enjoy gifts of slippers, crafts, crossword puzzles, and shampoo donated by local organizations. 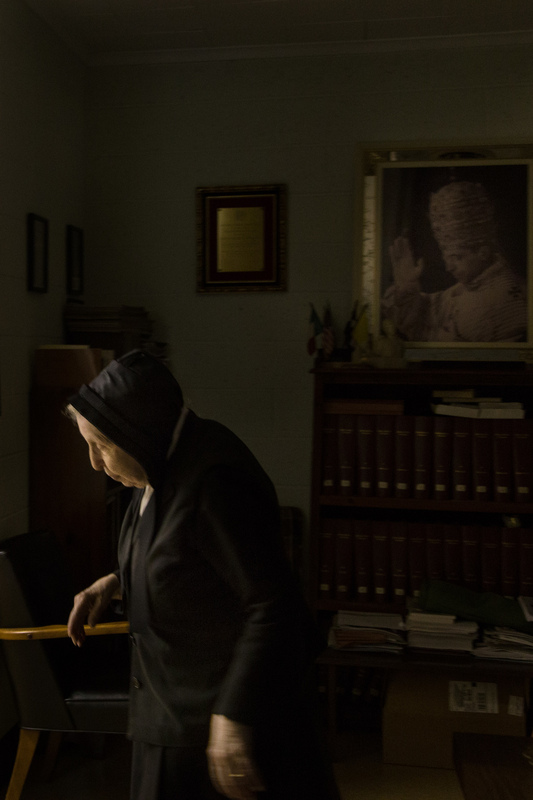 One of the oldest living Filippini Sisters, at 103, prays in the chapel. Daily life is filled with routines. Day after day passes in the same way. And a time for prayer. Sr. Mary: “Guilty pleasure? I would have to say, homemade Italian cookies and game shows. I love to watch game shows—especially Wheel of Fortune. I also enjoy playing Bingo with the other Sisters." Religious paintings, documents, and historical memorabilia now adorn the walls and fill many of the three-floor mansion rooms which was once a summer residence to Louis Charles Gillespie and his nine children, a multimillionaire businessman from Virginia. What does it mean to be a Sister? Sr. Mary keeps herself busy crocheting baby clothing for friends and crafting items for the Sisters’ Annual Christmas Sale. 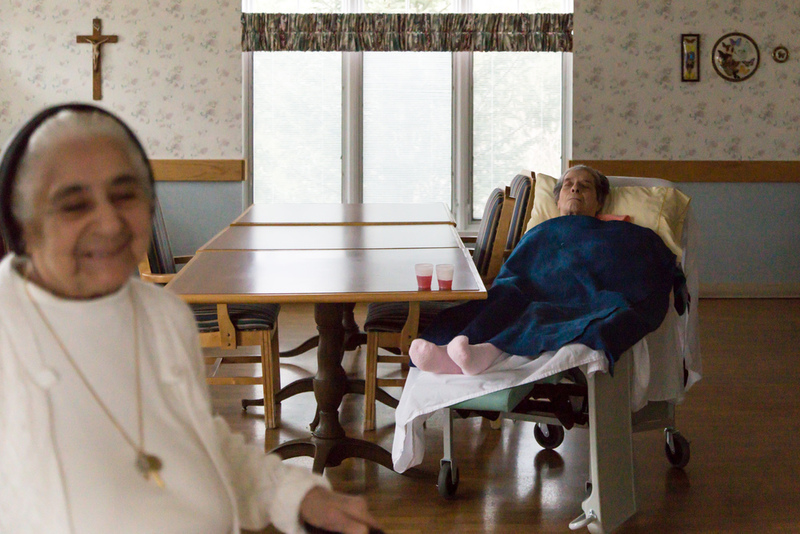 Approximately eighty aging Sisters live in the long-term care facility of Villa Walsh. They are able to maintain the opportunity to stay within the boundaries of their community encircled by Sisterly support. How has your calling been an inspiration to others? What is one of your fondest memories as a Filippini Sister?